Description: Annuals or perennials, usually tufted but of various habit. Leaves with ligule a rim of minute hairs or rarely membranous; blade flat, narrow, convolute, rolled in the bud, rarely absent. Inflorescence paniculate, open or contracted, or reduced to a raceme. Spikelets solitary, pedicellate; 3–many bisexual florets, usually closely imbricate; rachilla disarticulating above the glumes and between the lemmas, or persistent with the lemmas deciduous and the paleas subpersistent. 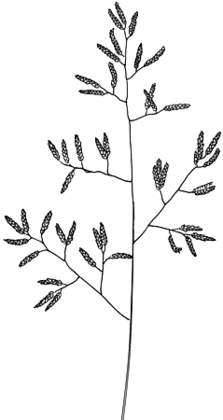 Glumes unequal, acute or acuminate, membranous, 1-nerved or the upper rarely 3-nerved, keeled. Lemmas acute or acuminate, 3-nerved with the lateral nerves faint, keeled or rounded on the back, overlapping, margins rarely ciliate. Palea equal to the lemma, 2-keeled, keel sometimes ciliate. Distribution and occurrence: World: c. 300 species, cosmopolitan, chiefly tropical & subtropical regions. Australia: c. 66 species (c. 52 species native, 14 species naturalized), all States. Eragrostis tef (Zucc. )Trotter commonly known as 'Tef Millet' and Eragrostis tephrosanthes Schult. may have become naturalised locally in NSW.